I am trying to do some testing and now have access to a QBO Sandbox company. I have tried to connect to it two different ways. 1. If I "Connect to QuickBooks" on the QODBC Driver for QuickBooks Online Setup Screen without checking the "Sandbox Company" checkbox, I can connect to QBO, but cannot see any data from my QBO Sandbox company. 2. 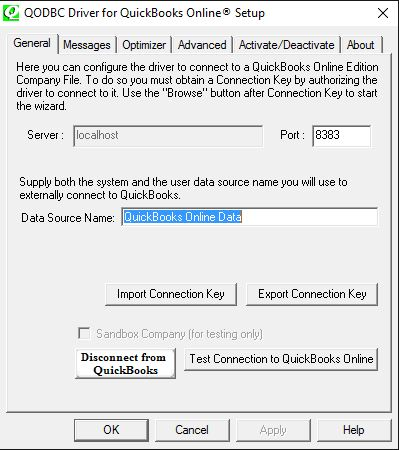 If I "Connect to QuickBooks" on the QODBC Driver for QuickBooks Online Setup Screen with the "Sandbox Company" checkbox checked, it goes through the QBO login screen and presents the Authorize button on the next screen. When I click on Authorize, it closes that screen and opens a new one which also requests Authorize. When I click Authorize on that screen too, it then reports "Connection Complete", but it never loads the Access Token and the "Connect to QuickBooks" button does not toggle to "Disconnect from QuickBooks." When I try to access my Sandbox Company tables using VBDemo, I get the error message shown in the attached file named "Error Message". Begin Session Failed. S0000 00000 [QODBC] QB Begin Session Failed. 658 - Access Token Not Found. Goto [QODBC Online Setup Screen] and Click [Test Connection to QuickBooks Online], Please Authorize QODBC Online to connect to Your QuickBooks Online Company. Please advice on correct process to connect to the Sandbox Company from QODBC. There might be some issue with Intuit authorization service. Please wait for 30 minutes and try again, you should able to connect to Sandbox company file.